Spring is in the air! It is beautiful, colorful and so much fun! We are beyond excited when Spring rolls around because there is so much to do outside before the heat of Summer comes. 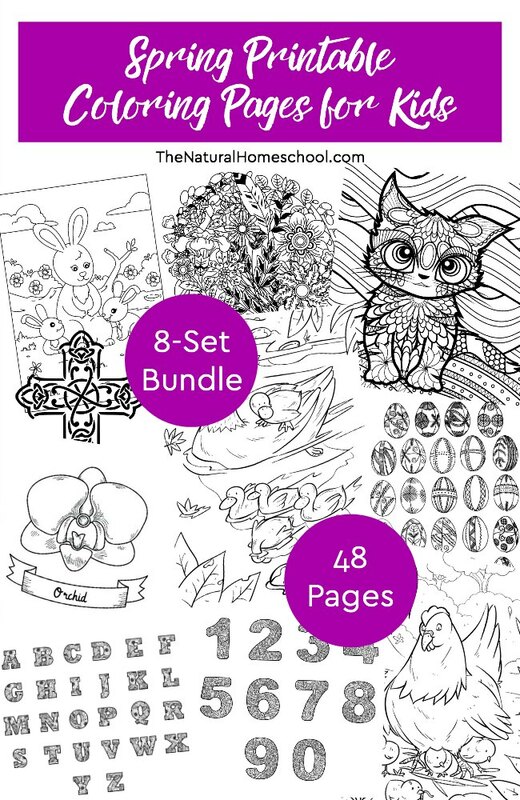 And in celebration of Spring, we have a wonderful bundle of 8 printable sets (48 pages) that your kids will love! Come and take a look at what this awesome bundle includes. Don’t think that these are just some cute coloring pages! They are educational as well! Come take a look at what the Spring set includes. The Spring coloring pages are wonderful! They’re full of what Spring is all about. Our Coloring Fruits & Vegetables cards are awesome because they’re perfect for teaching kids fruit and vegetable names. Here is a fun handwriting practice and coloring set that teaches kids the names of the days of the week and the names of the fruit the caterpillar ate in the story: The Very Hungry Caterpillar Craft ~ Day and Fruit Names Printable Book. Here is another fantastic printable to go along with this lovely story: The Very Hungry Caterpillar Printable Book of Numbers and Colors. This set of Bird Coloring Pages is great for researching these birds and coloring them in the correct colors! These Farm Coloring Pages will go perfectly with any farm studies that you might be doing! Another great set is the one with awesome Easter Coloring Pages because they celebrate this wonderful Spring holiday. For us, it is the highlight of the season. Lastly, teach your kids the names of 20 flowers with this set of Flower Coloring Pictures and Names. The pictures are beautiful! Research the colors of the flowers and color them correctly. Are you ready for this awesome Spring bundle? Coloring pages can be a great pass-time to practice art and fine motor skills or they can be used for educational purposes. Use them to learn, to do research and to award your kids for learning so eagerly about all of these 8 topics. There are 48 pages in all!